On February 5, 2019, the American Transportation Research Institute (ATRI) released data that analyzes the effects that emerging eCommerce trends are having on the trucking industry; including, the challenges and opportunities presented by more regionalized retail supply chains and by the increase in urban ‘last mile’ deliveries. Putting together this analysis was identified as a top research priority by the American Transportation Research Institute’s Research Advisory Committee. •	Annual growth of eCommerce has ranged between 13 and 16 percent over the last five years, outpacing the one to five percent annual growth in traditional retail sales. •	From 1999-2017, eCommerce sales increased from less than one percent of total U.S. retail sales to more than nine percent, reflecting a 3,000 percent increase in eCommerce sales. •	Retailers are becoming more flexible in how they transact with consumers by decentralizing their distribution/fulfillment networks to bring inventory closer to consumers. •	There were 2,130 fewer department store and 385,000 fewer jobs at these stores in 2017 than in 2015; there were 1,937 more courier services operating and just over 85,000 new employees hired in the sector during this time period. •	‘Last Mile Fulfillment Centres’ represented 73 percent of the industrial real estate market in 2017, a 15 percentage point increase from the previous year. •	Registrations for single-unit trucks increased by 7.8 percent between 2007 and 2016 compared to 4.4 percent growth in combination truck registrations. 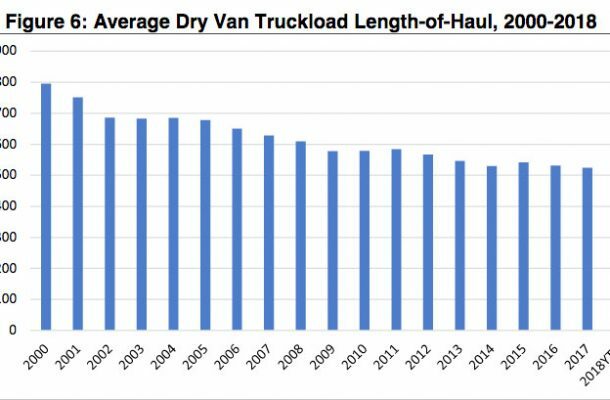 •	The number of intra-regional and last-mile truck trips has increased while the average length of haul has declined. Average trip lengths have decreased 37 percent since 2000, while urban vehicle miles traveled have increased for much of this time period. •	Intrastate and local hauls for eCommerce could serve as a training opportunity for 18-20-year-old drivers, representing a huge new pool of potential interstate CDL drivers.